Hell Hour: You don’t have to have them. Nope. Not at all. I just had to post this picture. 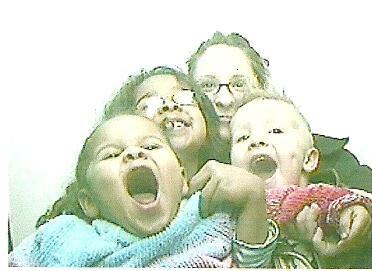 Above are my three daughters and my oldest grandson on a recent trip to the mall. They were in one of those photo booths with the hard bench and dark curtains that you pull shut on each side. When the red circle appeared on the screen, we (meaning I) thought they all had to fit into that circle. So they were scrambling to get close enough together to all fit in the picture. As it turns out, the camera was sophisticated enough that it could have gotten the shot if they’d all just sat normally but hey this was way more fun! Next Next post: Hell Hour: You don’t have to have them. Nope. Not at all.